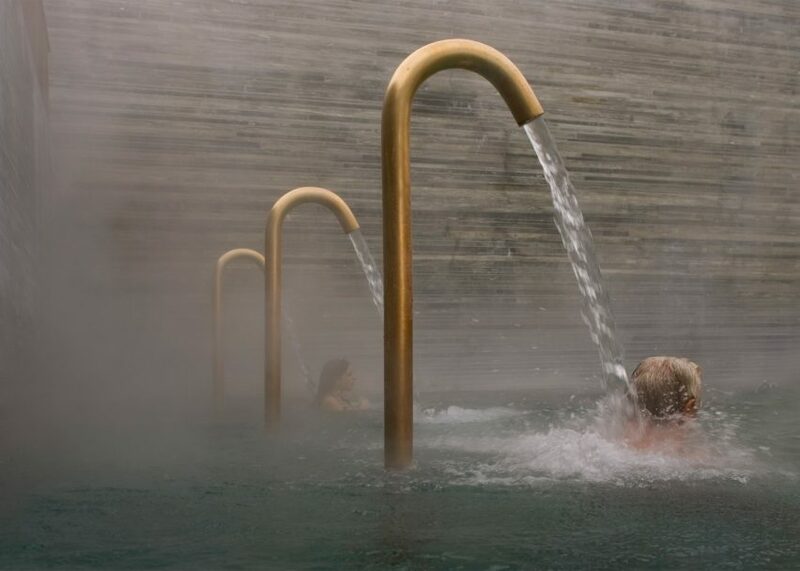 These images by Portuguese photographer Fernando Guerra offer a tour of Peter Zumthor's thermal baths at Vals, which celebrate their 20th anniversary this year (+ slideshow). 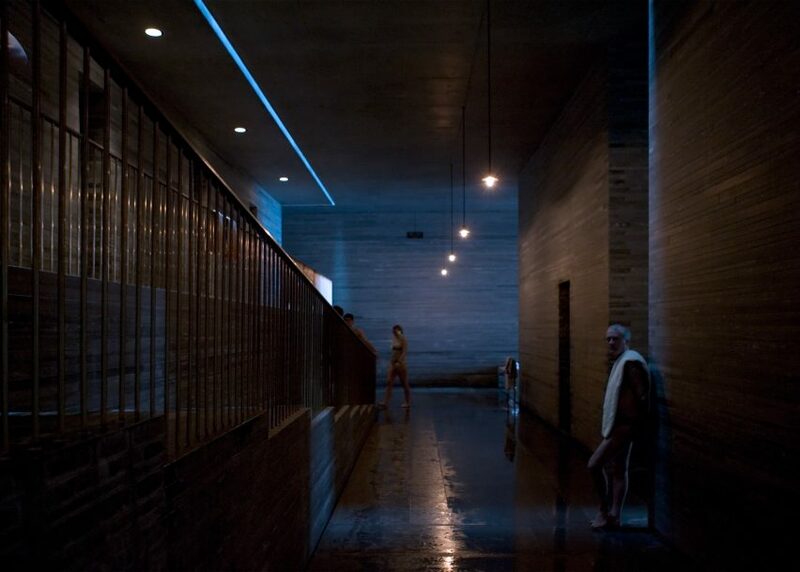 Completed in 1996, Therme Vals is widely regarded as one of the most important projects of Swiss architect Zumthor, whose accolades include the Pritzker Prize and the Royal Gold Medal. 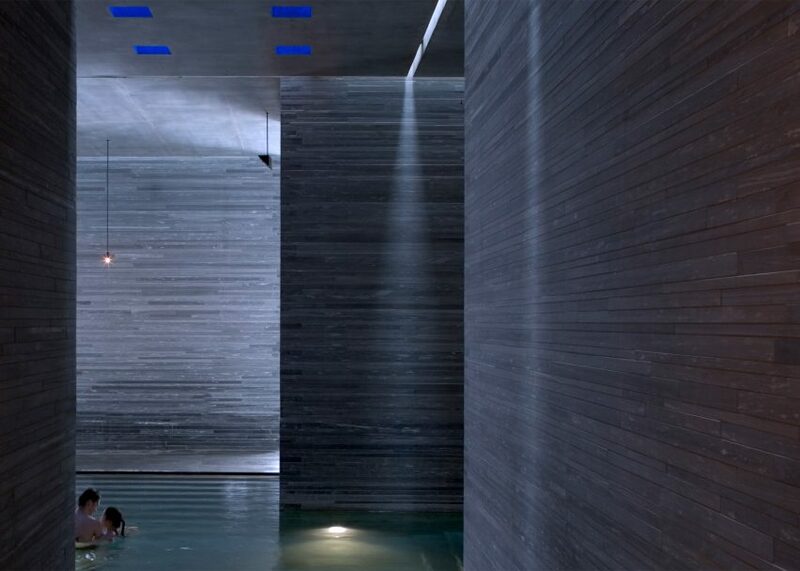 Built over the only thermal springs in Switzerland's Graubünden Canton, the hotel and spa is celebrated for offering a sensory experience of hot and cold, light and shadow, and materiality. 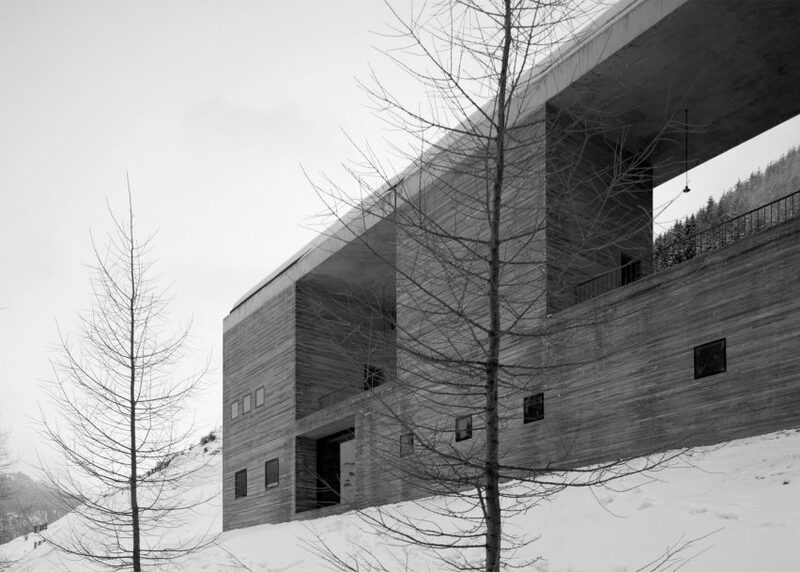 The building is partially submerged into the hillside and is covered by a grass roof, making it almost invisible from behind. 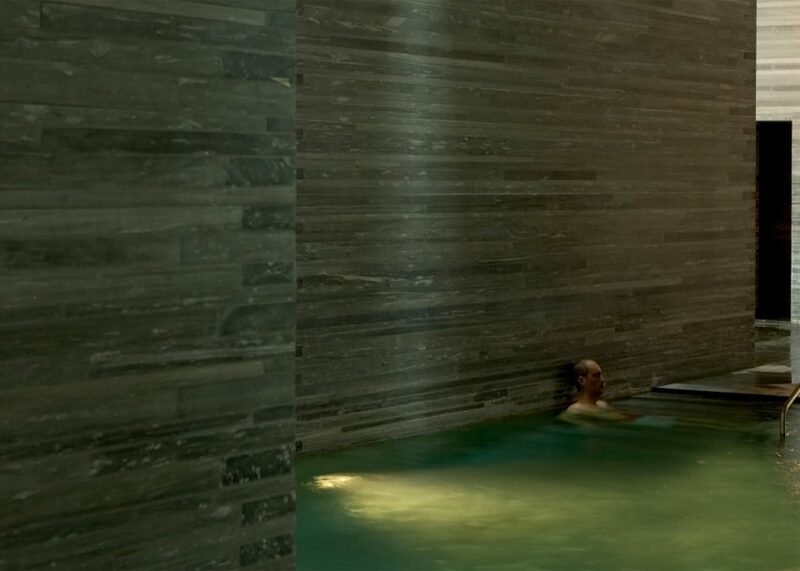 Its walls are made from a locally quarried quartzite stone, built up in layers to create multi-toned stripes. 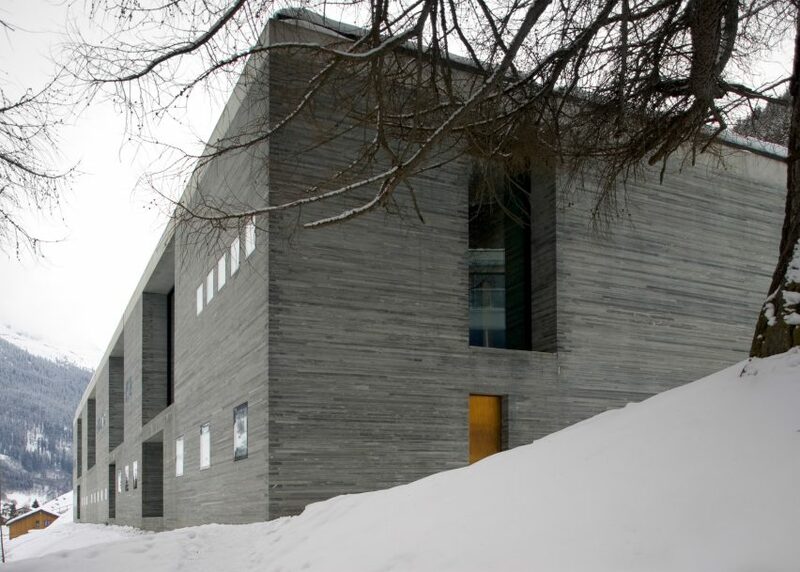 Windows are set within wide recesses, revealing the unusual depth of these walls. 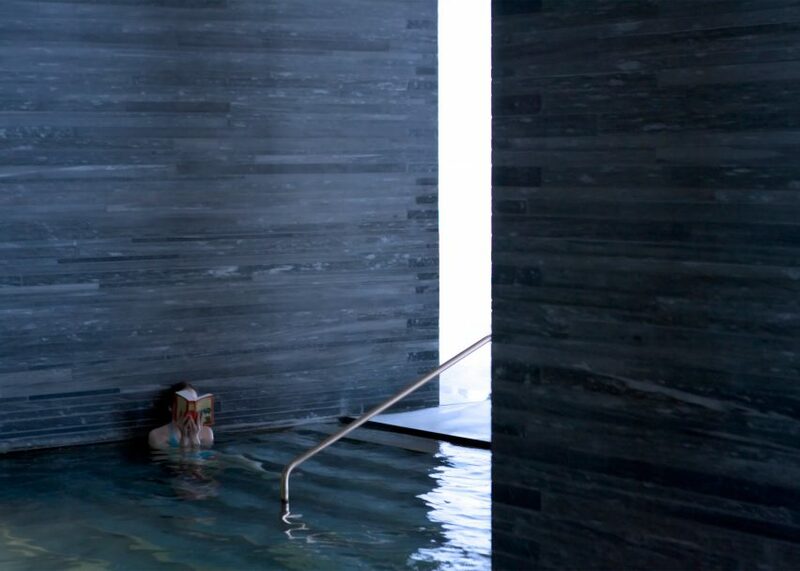 These stone surfaces continue inside the building but are contrasted with other materials, ranging from homogeneous concrete to polished terrazzo. 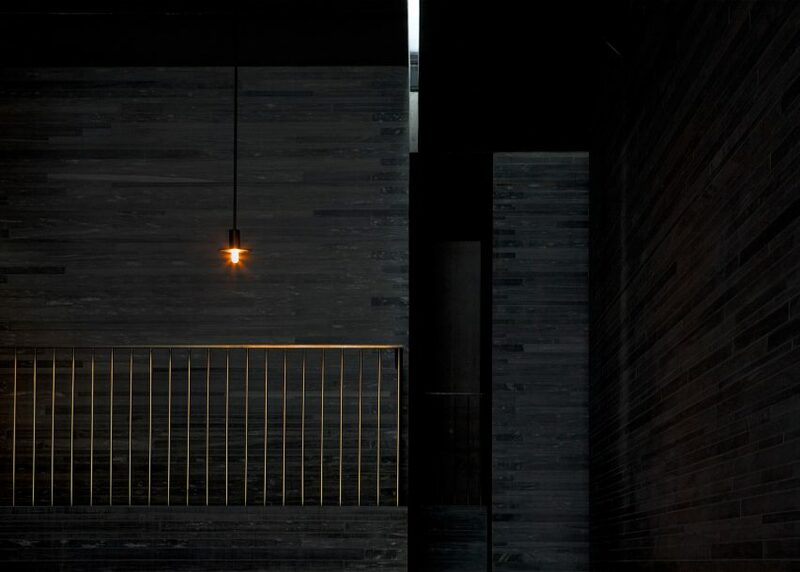 Black leather curtains screen changing booths lined with red mahogany, while details such as door handles and taps are picked out in bronze. 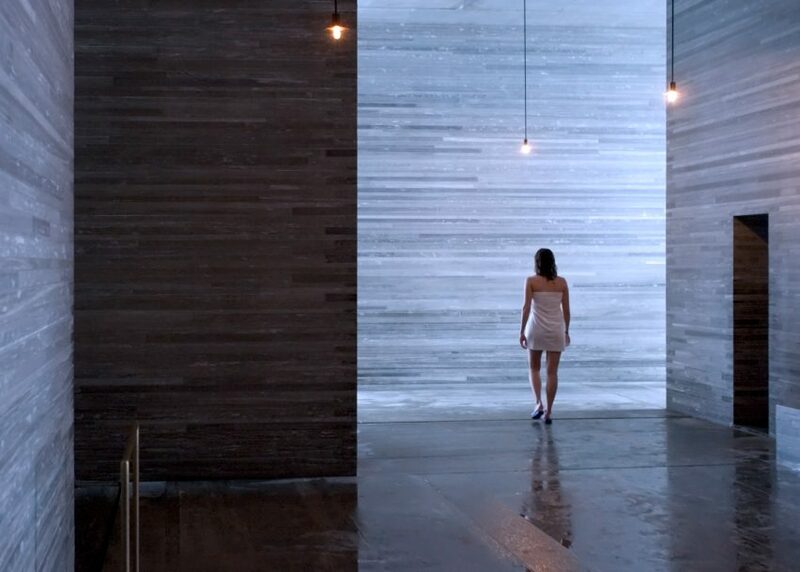 Both indoors and outdoors, the baths themselves offer a variety of different experiences. 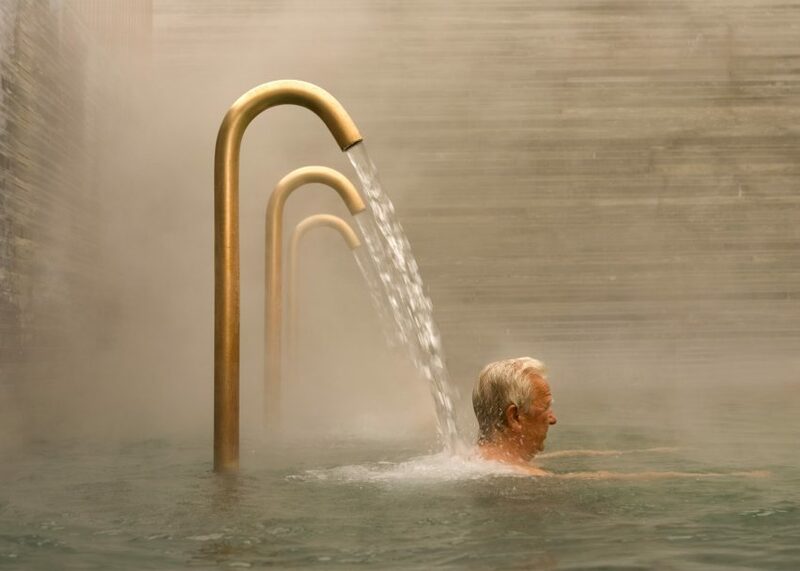 Temperatures vary from a frosty 10 degrees Celsius up to a more leisurely 42. 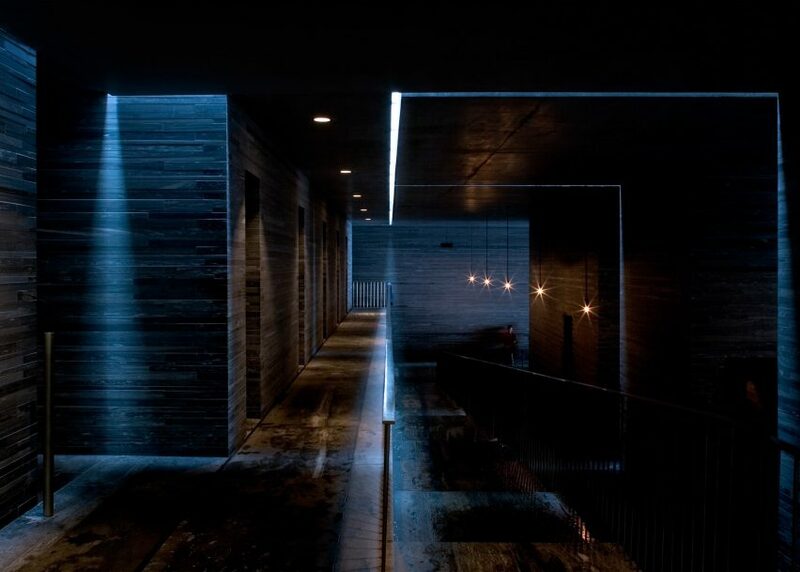 A curving tunnel leads through from the spa into the adjoining hotel to the north of the site. 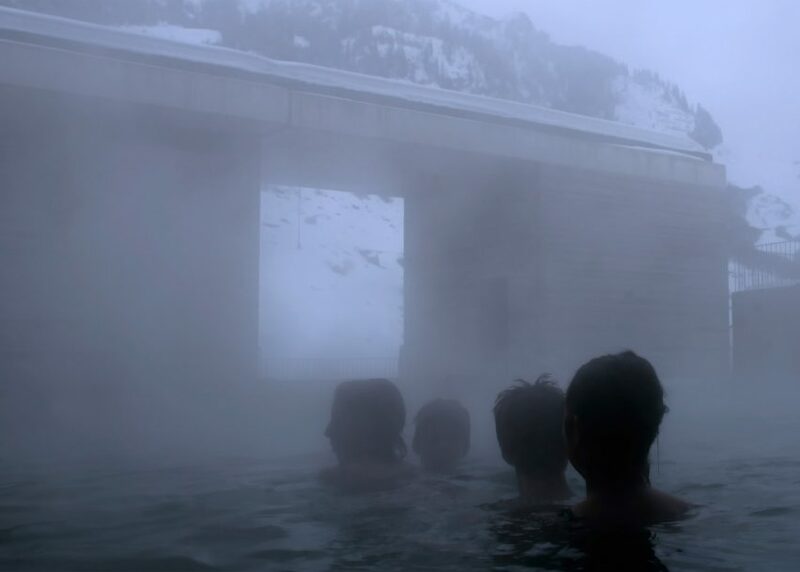 Therme Vals was one of six projects selected by curator Jane Withers as one of the best examples of the growing interest in communal bathing culture, as part of an exhibition for the London Design Festival. 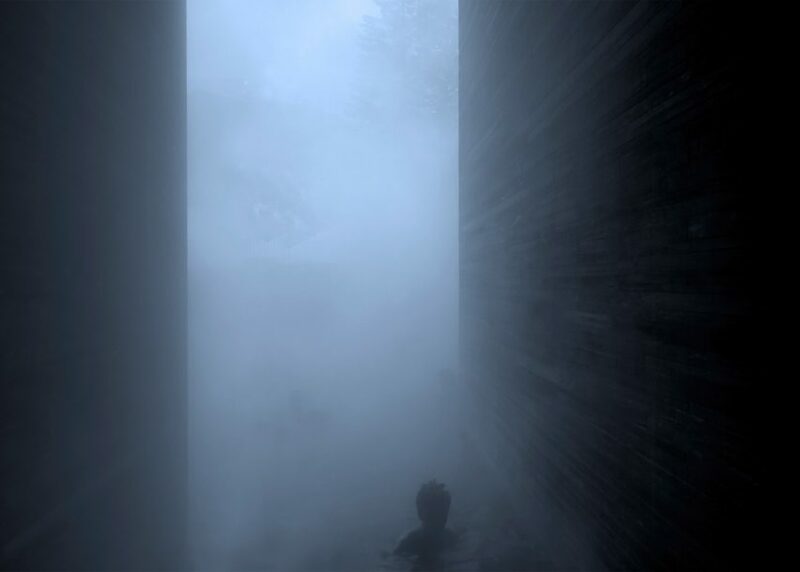 The building made the news last year, when Los Angeles firm Morphosis was selected to design a new hotel next door. The competition jury later claimed that the appointment went against their wishes. 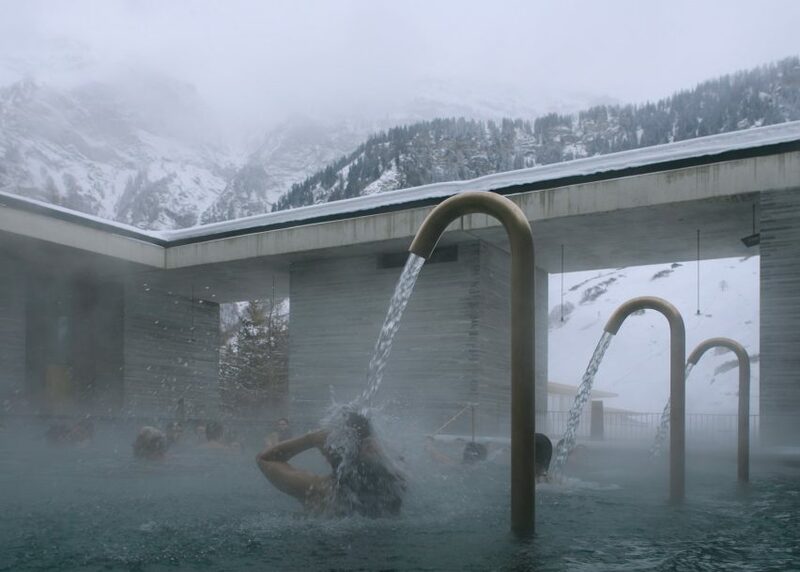 Fernando Guerra photographed Therme Vals in 2004, eight years after it opened. 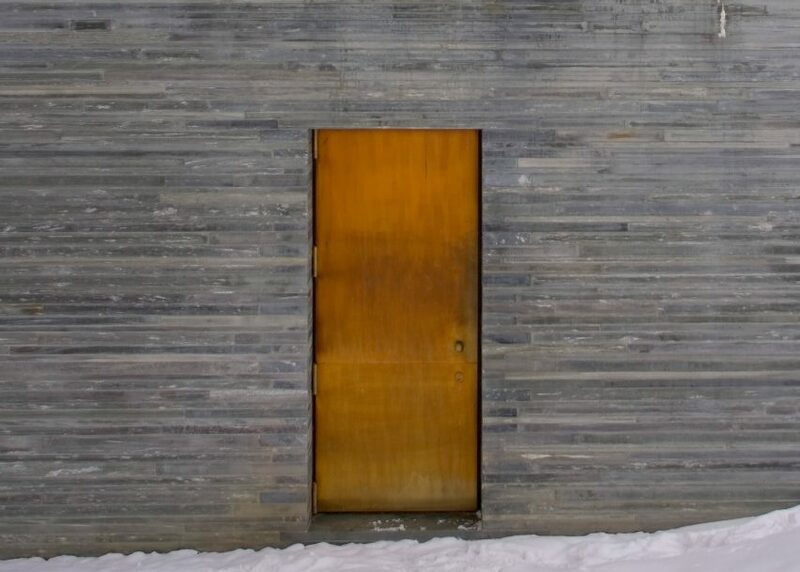 The photographer is better known for his ongoing relationship with Álvaro Siza, for whom he has shot over 70 projects, including the architect's first project in China.